The year is going very quickly and back in January I made a resolution to eat in 10 (I think it was 10) different vegetarian restaurants and write a review for you. and, of course, London which, for me, is the best. This latest review comes from London and is from a little cafe-style restaurant that I happened to stumble across in Convent Garden’s Neil Street. 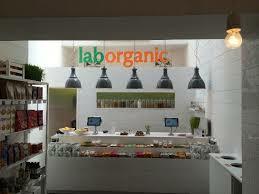 It’s called laborganic, and I guess, the first thing to say is ‘Lab by name, lab by appearance’, as the inside feels very much like a nail painting studio, rather than a health restaurant. 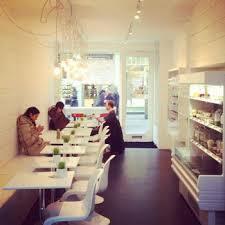 Everything is white and clinical, and you half expect to see mice running around wheels! 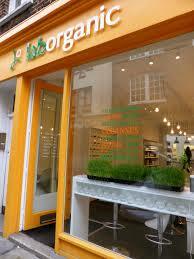 Now that’s probably unkind, because the food is very good quality, raw vegan with cold pressed juices and salads. Given my love of cold pressed juices and salad, I over ordered and bought: green lemonade made with cucumber and sweetened with stevia, and a delicious kale salad flavoured with a lemon dressing, and sat eating it on one of the white, ‘nail-painting’ styled tables next to some 20 somethings on one side, speaking Russian, and some 20 somethings on the other side speaking French. They were clearly all earning vast sums in order to pay the rather expensive prices! This is London after all! Overall, I think I’ll give Laborganic a 7 out of 10. I’ll certainly go back.